Judgment day came, and humanity fought. We lost. Demons control Earth and civilization is reduced to a few scattered bastions. Desperate times, desperate measures. Five Templar Knights are damned and sent to Hell as humanity’s last hope. And then it gets better. Holy crap this book was good! It hooked me from the very beginning. The first chapter was dark, darker than the rest of the book, but it did set the tone of what was to come. You can’t expect bunnies and unicorns when it’s a book about hell. Unless it’s The Evil Bunny of Doom or Bad Unicorn, fantasy version of Bad Horse. By the way, if you haven’t seen Dr. Horrible, go watch it now. But I digress. I loved this book. Its split in five acts, each telling the story from each of the main character’s perspective. With a sixth pulling everything together. I enjoyed each tremendously. The characters were all compelling and unique. Each dealt with being damned in their own way, but all paths took them towards the same end. Some through more hardship than others, but each suffered to reach their destination. The voices were different and characteristic. I could tell how each character spoke differently. Different ways, different words, different rhythm. I really don’t like it when I read a book and all characters speak the same way. Make the same jokes. Use the same expressions. It eventually reads like one person with multiple personality disorder. Not in this case. I was both sad and happy when an act ended, because it meant I would stop hearing Jacob, the main character among a cast of great ones, but I’d get to meet someone else. I didn’t really have time to be sad about leaving a character behind, because the next one called to me. It was one hell of a ride (Damn me but I tried to resist that one. Sorry. I feel unclean now). I was eager to know where the story would go. And let me tell you, the last act, The Book of the Apotheosis, is the icing on the hell cake. I’m avoiding spoilers like crazy here. By the end of it I was left wondering where it would all go from where it left off. And let me tell you, I have no idea. At. All. Which is good, because now I’m all the more eager to find out! It’s an epic story. Epic I tell you! I’m having a hard time finding the words to describe just how much I liked it and how much I recommend for you to read it. When I finished it, I had to stop and figure out how to write this review without reverting to my usual mode of review, which is: It’s so good! You should read it cause it’s… SO good! And if THAT doesn’t make it appealing to you, there are Dragons! And Zombies! Hordes of them! And the “magic” system is pretty original too. Humanity discovered that the soul is actually real and it serves as a conduit between humanity and the divine. And once harnessed, you could widen that conduit, pray, and have your prayers answered. Immediately. That said, it’s not a religious book. You might think with all the hell and heaven flying about, it’d be about religion. It’s not. It’s about faith, which in my opinion can be independent of religion. And also, ZOMBIES! DRAGONS! 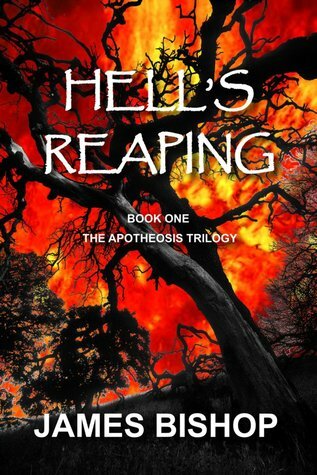 Buy your copy of Hell's Reaping today on Amazon or Smashwords. Nice review. I have also read the book, and I am a female senior citizen not usually drawn to this subject matter. I found it compelling in its action, thought provoking in its investigations of human conscience and spirituality, and fascinating in its pure imagination. Bishop has quite a gift for storytelling, and I especially like that he doesn't lead the reader...he tells an intense tale that invites the reader to experience what his characters experience, which is my favorite kind of reading.